Cruising down the Mekong River has been on my bucket list for a while. I didn’t know how, I didn’t know when, but I knew that one day I would get to sail down this glorious river. My opportunity came when I decided to take the slow boat form Huay Xai to Luang Prabang in Laos. The cruise would last two days, roughly 8-9 hours each day. Usually when I romanticize something to such a degree I am setting myself up for disappointment. How could the Mekong possibly be as enchanting as I was envisioning it to be? After a boring cruise down the Irrawaddy River, where the scenery left much to be desired, the boat was cramped and overcrowded, and I slept three hours below deck to the obnoxious churning of the boat’s engine, my expectations for the “luxury” cruise on the Mekong were low. Boy, was I in for a treat. The first thing that wowed me was the boat. From the outside, it doesn’t look much different from the other slow boats. It’s wooden and narrow, with a low roof that can be opened. However, the interior was fabulous. I especially loved the tables, which were the perfect height to work from. 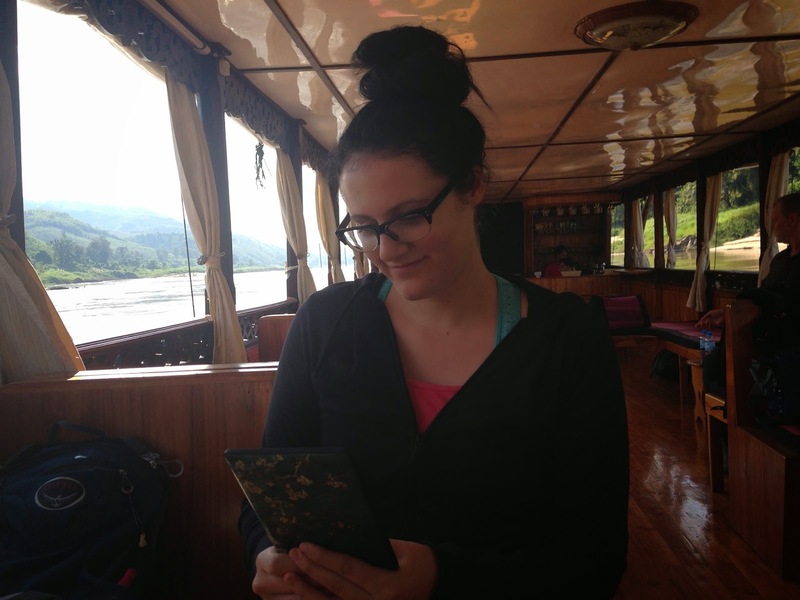 Never did I imagine I would be able to write on my laptop while cruising down the Mekong! There were also long padded seats, so I could lay down and take a nap (which I did). The boat looked like it could hold 20 people comfortably, but there were only 12 on my cruise. This was great because every group had an entire table to themselves, and there was plenty of room to move around and take pictures. On the Shompoo Cruise, unlimited coffee, tea, and water are provided throughout the day, and one buffet lunch is included. Both days the food was incredible. Local ingredients and Lao flavors made these dishes extra special. I was also grateful that there were fewer people on the boat because that meant more food for me! The river was very calm and the boat did not sway at all. There was absolutely no risk of motion sickness on this boat, and I was surprised that I was not even aware of any hum from the engine. It was a quiet and comfortable journey. By far the best thing about the cruise was the Mekong River itself. The scenery was absolutely stunning. Tall, rolling mountains boarded both sides of the river with views that would never tire the eyes. While on the boat, it was important to me that I faced forward, towards the direction we were headed. If I sat backwards, which I did for only a moment, I felt annoyingly trapped in the past. As though I was falling horizontally, without knowing when I would hit the bottom. Facing forward let me know I was going somewhere. Progress was being made. It brought the mountains to me, the view presented them like gifts before my eyes. But from behind they looked as if they were fleeing me. Escaping from my vision. From above, so many textures of green could be seen in the wobbling edges of mountain peaks. Rich velvet green from the droopy willows. Knife green from the palm tree leaves, milky green from the bushes on the shore, and between then, in their folds and cavities, even deeper shades. Rays of light don’t shine straight down from the sky like beams, they bend and weave around rocks and shadow the uneven hemlines in the shorelines like ribbons. With the price of the cruise a few short tours are included. We stopped in a Khmu village, a Lao Lao village, and the Pak Ov Caves. They were all brief but worthwhile sights. I strongly recommend paying more for a luxury cruise on the Mekong, instead of taking the overcrowded slow boat. We we docked in Pakbeng for one night, I saw over 60 people step off a boat that was the size of the one I shared with 12 people. This may be your only chance to see the Mekong. See it in style. The Mekong Smile Cruise takes two days to cruise from Huay Xai to Luang Prabang. The Mekong Smile Cruise is located in the town of Huay Xai, Bokeo Province, Laos. It’s close to the border of Thailand across the river from the Thai city of Chiang Khong . Please contact the following for more details: Mekong Smile Cruise office it’s next to Phonethip guesthouse.